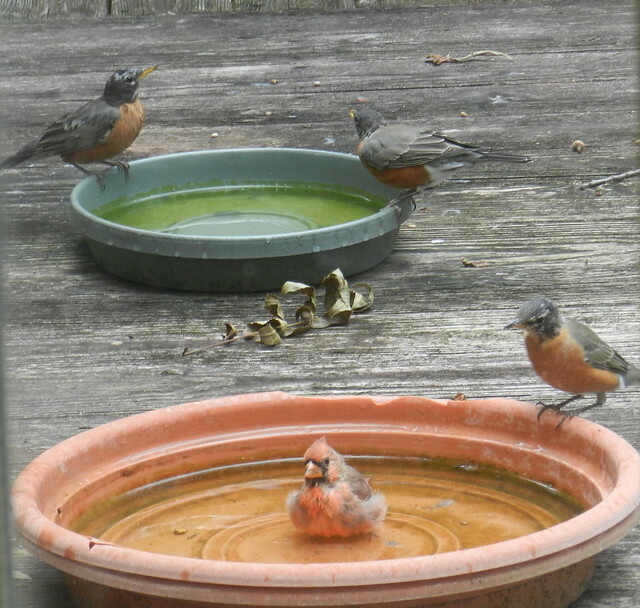 There were so many birds at the bird baths that I got some shots before cleaning the baths and putting in fresh water. 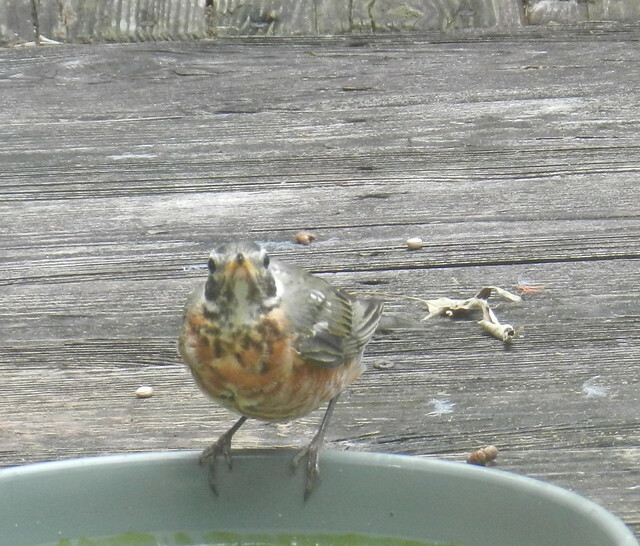 Very blurry but I like the personality that comes out in the next shot of the American Robins. The juvenile robin was turning its nose up at me. At first I thought the pink grass at the NC Art Museum park had some white grass mixed in but it turned out to be dew. The next soft sculpture is new and it will take me a while to decide what I think about it. 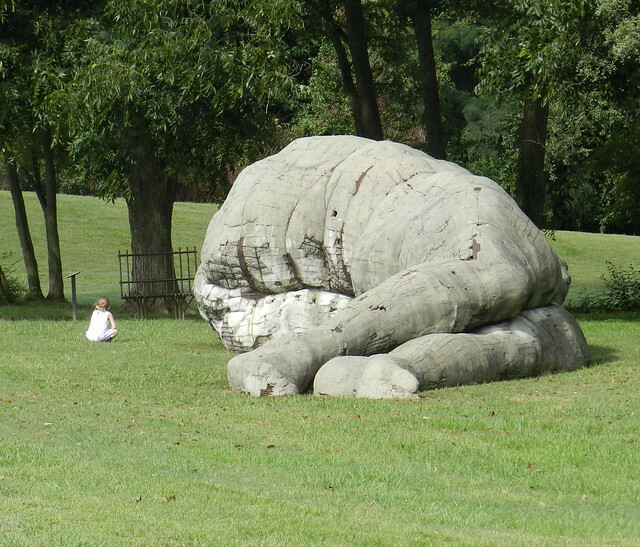 The little girl gave scale to the next large sculpture. The child had on purple wellies which were adorable on her. The evening are getting cool which has given us some very pleasant mornings for walking. 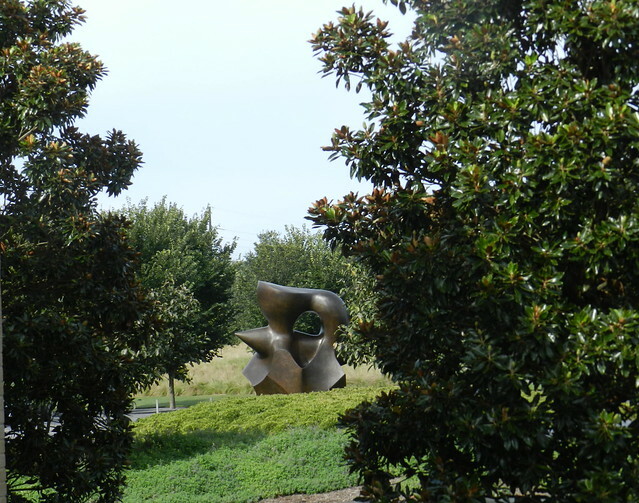 The new trees which went in a few years ago when the new museum addition and reflecting sculpture gardens were put in are becoming established. 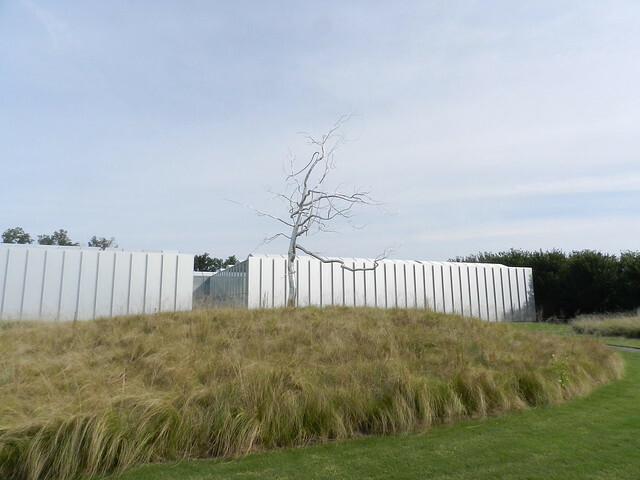 Before long there will be some bare trees which is what the next sculpture reminds me of. 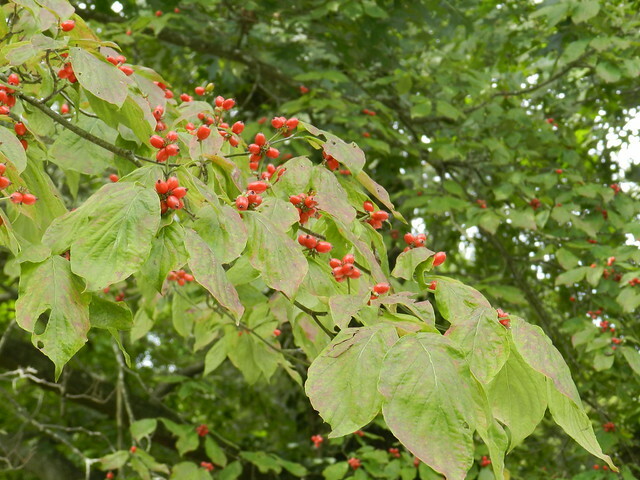 My dogwood trees are changing more every day. I was photographing my next door neighbor's dogwoods when I was startled to spot the pink blossom on the tree beside it. 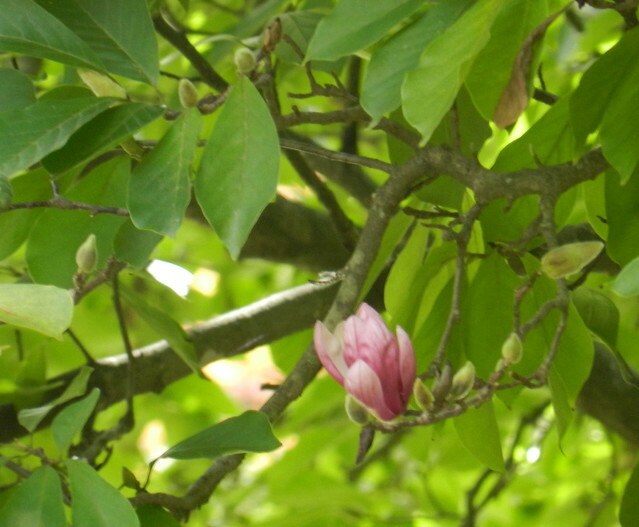 Their Japanese Magnolia has a few blooms which is bizarre. This tree loses its leaves in the fall and sets buds in late winter. The blossoms are in early spring before the new leaves grow. I have never seen it bloom when it has leaves at the end of the summer. Juvenile robin looks impudent. One year I'll get around to putting in a bird bath too. 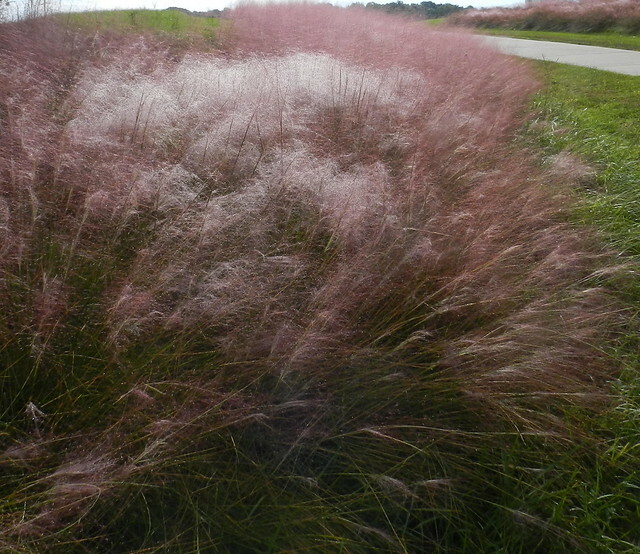 The dew on the pink grass makes it look almost like cotton candy. 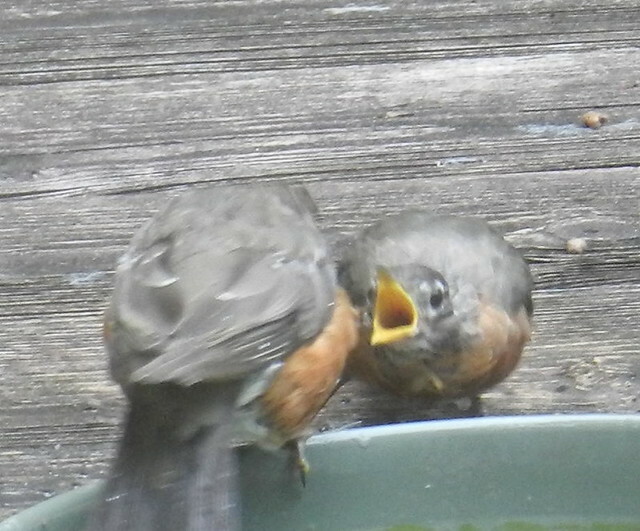 Love that baby robin begging for MORE! Lovely shots - and I really like that big sculpture. Wonderful series of autumn shots ~ the dew of the grass is unique but love them all! Great shots for OWT! I don't like it if someone is watching me take a bath either! Fun, beautiful captures and I agree with Fun60, don't want someone watching me take a bath either!! Thanks for sharing the fun!! Beautiful early fall --- love the baby robin yelling at mom and then snubbing you. Your pictures show your birds' personalities. 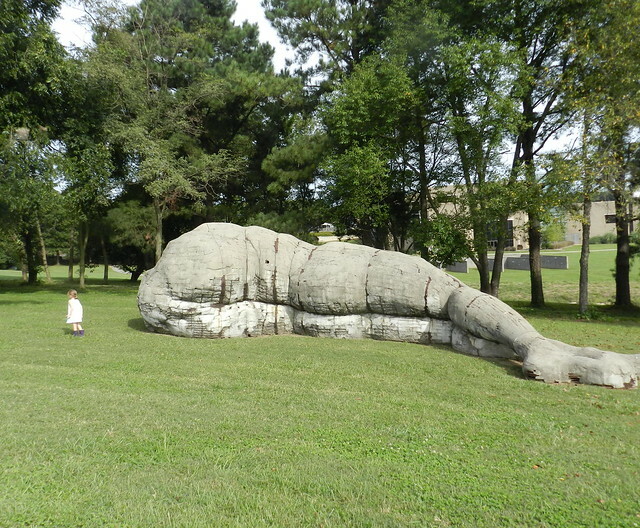 Interesting sculpture park there. 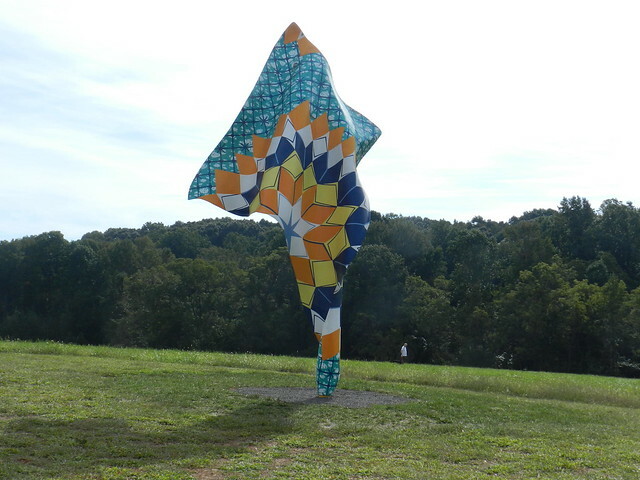 I like outdoor art. Loved all the pictures, but especially those with the birds. Love the American robins, so different to our UK ones. Love the pretty Robins! And the grasses are pretty. What a neat sculpture, it is huge.. Great shots, have a happy new week! What a lovely set of photos. Very cool! Japanese magnolia is blooming right now? It's a little late isn't it? Seems like nature is confused on your side of the world as well. A lot of my trees flowered last autumn as well and my cyclamens have takes to flowering twice a year as well. Love your shots especially the foreshortened one, of the recumbent figure with little girl. 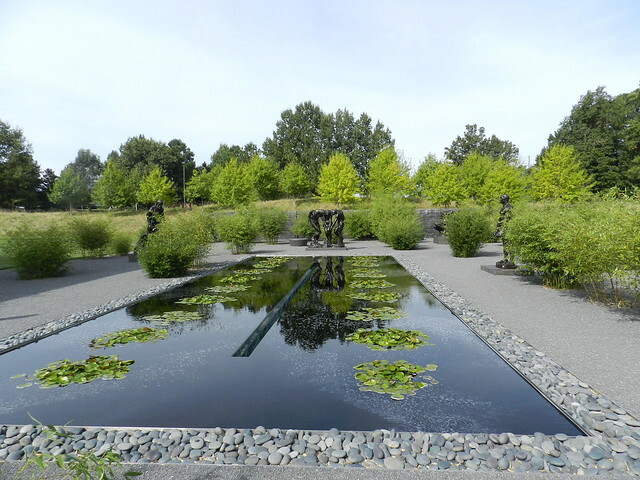 Amazing sculpture and I liked the capture of dew too. lovely series. that magnolia tree is all messed up. the pink grass and dew is so pretty. Oh, love all those bird bathers! Cool statues! Gorgeous aspects, indeed! What a lovely autumn walk!! 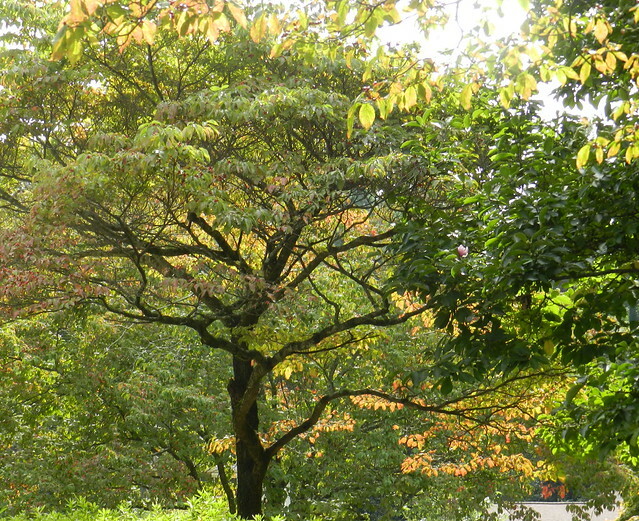 Have a sunny october day!